A visual approach to Introduction to Nutrition for Non-Majors. Guide students to a deeper understanding of nutrition The 4th Edition of Nutrition & You provides students with a personalized approach to understanding nutrition and teaches them to become informed consumers of nutrition information through interactive lessons, practical applications, and visual study tools. Joan Salge Blake writes in a very engaging style, addressing the student directly, using visual analogies in order to explain concepts, and captivating students with humor. Blake encourages students to think critically and relate the science of nutrition to their own dietary habits, enabling them to separate fact from fiction and to distinguish high-quality nutrient sources from those of lesser quality. New additions to the 4th Edition include a clearly defined learning path with the inclusion of learning outcomes throughout the chapter, cutting-edge content on the latest dietary guidelines and Nutrition Facts Panel, along with food waste and sustainability, making the text relevant and interesting for today’s students. Visual Chapter Summary learning objectives, a newly revised suite of Nutrition animations, mobile-accessible and improved NutriTools, new Health Connections case studies, and new author-narrated Focus Figure walkthroughs have all been added to help students learn more effectively. Also available with Mastering Nutrition This title is also available with Mastering™ Nutrition--an online homework, tutorial, and assessment program designed to work with this text to engage students and improve results. Interactive, self-paced tutorials provide individualized coaching to help students stay on track. With a wide range of activities available, students can actively learn, understand, and retain even the most difficult concepts. Note: You are purchasing a standalone product. Mastering Nutrition does not come packaged with this content. Mastering Nutrition is not a self-paced technology and should only be purchased when required by an instructor. 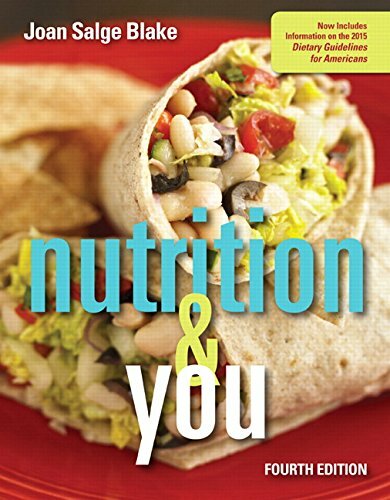 Students, if interested in purchasing this title with Mastering Nutrition, ask your instructor for the correct package ISBN and Course ID. Instructors, contact your Pearson representative for more information. If you would like to purchase both the physical text and Mastering Nutrition, search for: 013416749X / 9780134167497 Nutrition & You Plus Mastering Nutrition with MyDietAnalysis with Pearson eText--Access Card Package, 4/e Package consists of: • 0134167546 / 9780134167541 Nutrition & You • 0134209389/ 9780134209388 Mastering Nutrition plus MyDietAnalysis with Pearson eText -- ValuePack Access Card -- for Nutrition & You Nutrition & You , 4th Edition is also available via Pearson eText, a simple-to-use, mobile, personalized reading experience that lets instructors connect with and motivate students — right in their eTextbook. Learn more.